What is included in the field of a work of art? The medium may be painting or performance, the subject matter may be landscapes or the death of a lover, and the aesthetics may come from a particular tradition or vein of art. But beyond that, when we discuss a work of art, what else can or should be included in that conversation? Of course, there is no “can” or “should” — each work of art represents a kind of nerve firing within the brain of the wider culture. Each viewer has their own experience and makes their own connections — there are no rights and no wrongs. But within criticism or writing about art that takes place in fancy magazines (or even blogazines), what we talk about when we talk about art can sometimes feel like it has boundaries that are defined by issues far beyond the arts. Enter Jennifer Doyle’s latest book, Hold it Against Me: Difficulty and Emotion in Contemporary Art. In this rich, thought-provoking, and very readable work of scholarship, Doyle poses questions about works of art that cannot be easily described, that bring complicated personal and political subject matter to the fore, and that often evoke strong emotional reactions in the audiences that view them. She discusses a selection of art work, most often performance, by artists such as Ron Athey, Aliza Shvarts, James Luna, Carrie Mae Weems, and David Wojnarowicz, among others. Doyle sets up a couple of theses in the book. First and foremost, she argues that it’s worth paying more attention to the role that emotion plays in many works of art — both the artists’ expressions and manipulations of emotion, and also the audience’s emotions in experiencing a work. And it’s not just an academic point. She’s pushing further to say that in many cases, how we feel about a work of art or our role in viewing or witnessing it can, in part, have roots in how we relate to the bodies, politics, and social or economic status of the artist. In other words, when we have strong or unresolved feelings about a work of art, we aren’t just dealing with the art, we’re also being forced to deal with ourselves, if only briefly. Doyle seems to be asking us to look at why we choose to stay in or promptly exit those difficult moments, and what can be gained in examining those impulses. Further to that last point, she circles the idea that it’s often the case that a good amount of the work that makes us uncomfortable is quickly labeled as scandalous. She returns often throughout the book to the work of Ron Athey, whose performances regularly include sadomasochistic imagery, such as cutting and piercing, along with evocations of ritual and religion. 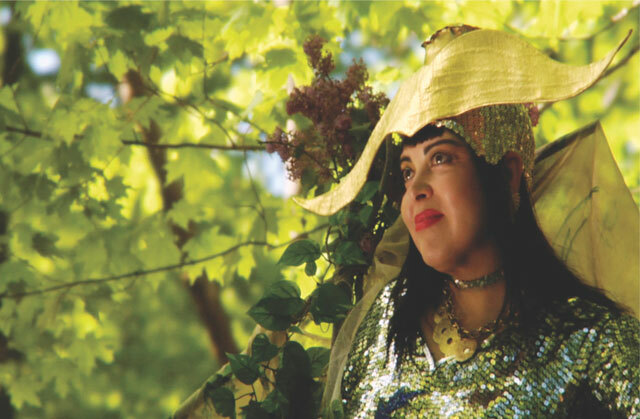 Athey is known to many who lived through the 1990s as one of a number of artists who were targeted by conservative politicians in their desire to use the AIDS epidemic in the US as a reason to codify bigotry and intolerance for religious difference through legislation. In the case of the arts, they specifically sought to exclude from funding and censor LGBTQ and feminist artists. Athey’s work at that time became one of the focal points for these legislators. As an out gay man incorporating blood and sexual imagery into his performances, Athey became a ready and easy target. False characterizations and descriptions of him and his work were spread quickly from the mouths of politicians and religious leaders into the writing of prominent national publications and television programs. Doyle attempts to pull back the curtain from that sideshow and look at what Athey was actually doing in his art, along with the roles that the emotional and visceral elements of his work played in communicating with his audiences. I would change that last phrase “being a social subject” to “being human,” but we are writing for different audiences and I think the point is the same either way. A second overarching thesis that she sets up in the book relates to art criticism. At root her argument here is that art criticism seeks clear narratives or summary judgments about a work that can fall prey to talking about difficulty as controversy and dismissing emotion as irrelevant. Certainly there is a ton of arts writing out there that is bad, I don’t think anyone is going to argue with that, but she often talks about criticism in general terms, setting it up as a kind of strawman at the very same time that she pulls quotes and thinking throughout the book from writers like Lucy Lippard and Cynthia Carr, both of whom have been doing really personal and rich arts writing for decades. Which is to say, okay, yes, there’s bad criticism, but there’s also fantastic criticism and arts writing, particularly a lot of the work rooted in a feminist methodology or standpoint that has for decades offered rich alternatives to the easily identifiable blowhards. Which left me feeling like some of the conversations around criticism were overly general and a bit of a distraction from her other points, particularly when she so often referenced rich and nuanced writing about art. Another thing that really struck me is that she’s genuinely trying to practice what she’s preaching, which seems like no easy task at all, particularly in the context of an ostensibly academic publication. At numerous points she reveals discomforts and difficulties she herself has had in viewing and participating in works, including those of Ron Athey, with whom she shares a friendship. I also noticed that in a couple of those moments personal reflections she seemed to slip into imposing her assumptions about the reading of a work onto fellow audience members. I don’t point this out as a failing. In fact, I think it speaks volumes to just how difficult it is, within the confines of our language, and within the confines of offering perspective on complex subjects, to find ways of not making assumptions or building larger narratives. Narratives are fundamental to communication. Ambiguities and inabilities to know are incredibly difficult to articulate because the whole point is that they are themselves inarticulate; they wouldn’t be ambiguous if we could sum them up tidily. And, at least for me, resisting the urge to tie things up neatly is incredibly difficult, both personally and professionally. I thought this book presented a great challenge when confronting those difficulties. 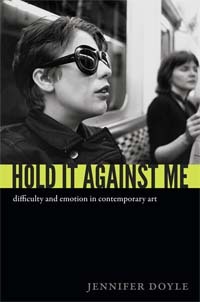 Jennifer Doyle’s Hold it Against Me: Difficulty and Emotion in Contemporary Art is available on Amazon, from Duke University Press, and elsewhere.